PINEHURST, NC … Golf Pride® a division of power management company Eaton and an industry leader in grip innovation, today announced expanding its popular TOUR SNSR™ putter grip family with the new Contour Pro. The Contour Pro putter grip offers the leading Tour-preferred, pistol-shape in two oversized models for unsurpassed feel and feedback. 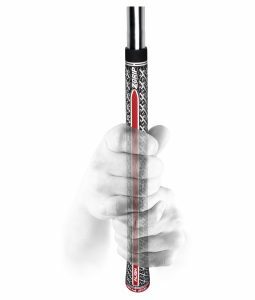 The TOUR SNSR Contour Pro utilizes the same soft, ultra-tuned rubber formulation as its predecessors giving the grip an excellent feel and facilitating lighter grip pressure to encourage a smoother stroke. The proprietary TOUR SNSR technology enhances feedback, affording better distance control on greens of all speeds. The TOUR SNSR Contour Pro putter grip also features soft, rounded edges, and a pistol flare back to more naturally fit in the hands. The shape includes a wide, paddle front for a consistent landing zone for the fingers and a tapered profile for players who prefer the traditional, sculptured grip design. This pistol shaped putter grip with contour has been trusted by the best players in the world to win the most coveted championships in golf. “The TOUR SNSR has been our most popular putter grip family since its introduction two years ago,” said Bruce Miller, product manager, Golf Pride. “With the new Contour Pro, we took our most preferred shape on TOUR and combined it with our oversize TOUR SNSR technology. When it comes to putting, amateurs and professionals are on a more level playing field. Available in an understated black/grey colorway, the TOUR SNSR Contour Pro putter grip will be available at retail March 2019. The Contour Pro putter grip will come in 104cc and 140cc size options and feature a retail price of $26.99. For more information on the TOUR SNSR Contour Pro and the entire 2019 Golf Pride product offering, visit GolfPride.com. Eaton’s Golf Pride Division is one of the world’s largest manufacturer of golf grips, with manufacturing, sales and distribution facilities on six continents. The division’s Golf Pride brand is recognized globally as the number one choice in grips among TOUR and recreational players, competitive amateur golfers, club manufacturers and club repairmen. For more information, visit GolfPride.com. Eaton is a power management company with 2017 sales of $20.4 billion. We provide energy-efficient solutions that help our customers effectively manage electrical, hydraulic and mechanical power more efficiently, safely and sustainably. Eaton is dedicated to improving the quality of life and the environment through the use of power management technologies and services. Eaton has approximately 99,000 employees and sells products to customers in more than 175 countries. For more information, visit www.eaton.com. To obtain product or photo samples, contact: Jared Kelowitz at jaredk@jdpr.com.